Results above are the STE running GB6 at 32MHz CPU & ROM. This gives a huge boost in ROM/GEM speeds and also huge boost in Integer Division. This booster can be switched back to 8MHz by linking the SW wire to GND. 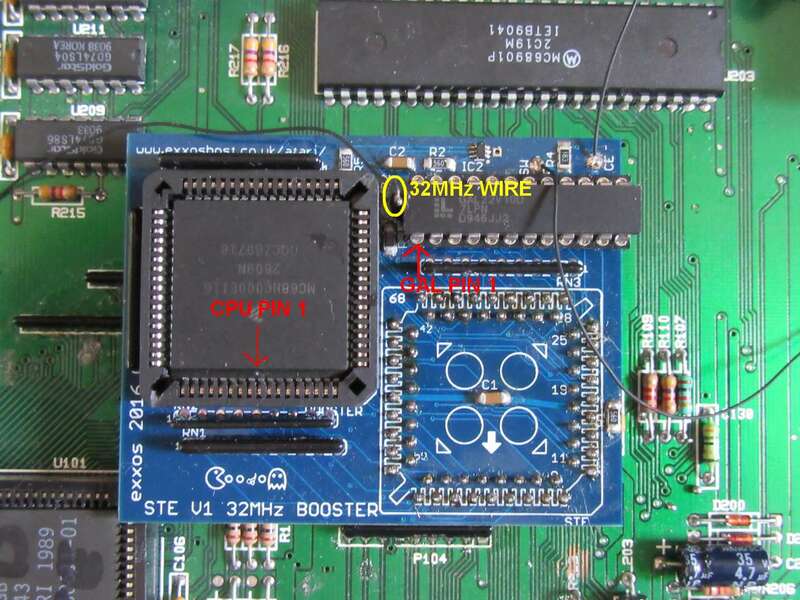 When the wire is left disconnected the 32MHz boost is active and is its default operating mode. 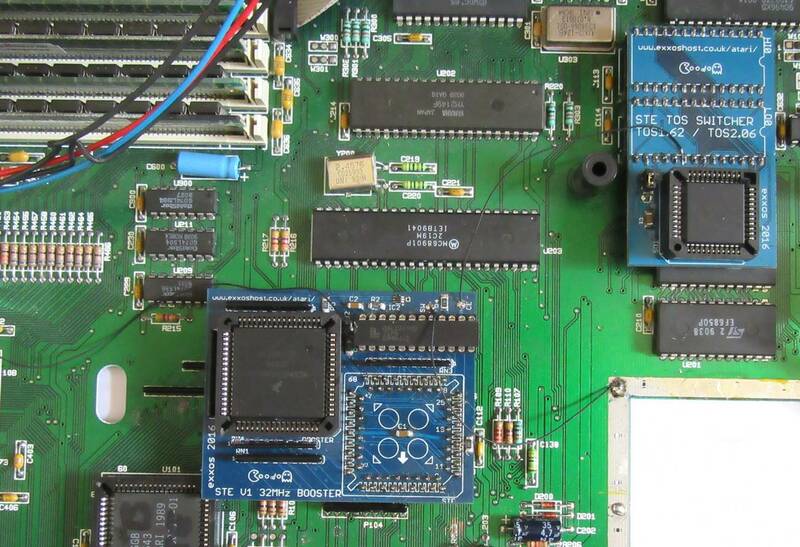 Fitting the Fast ROM board can be found HERE. First of all the old CPU needs to be removed. A guide on a method for removal can be found HERE. The STE booster itself is normally supplied with the SMT parts soldered, leaving the larger parts to be soldered in place. I would suggest the larger pin on the header strips be soldered into the booster board. I also suggest the pins are slotted into the motherboard and the booster PCB for soldering as if they are not aligned correctly it will likely be problematical in fitting the pins into the motherboard. NOTE: Machines with a separate blitter (in a PLCC socket) the corner of the booster board overlaps the blitter socket (oops). While this shouldn't cause any huge issues, the booster board will likely not be able to solder flush to the motherboard. If this is a issue for anyone, then you can snip off the corner of the booster PCB. Just cut enough to allow fitting around the blitter socket, and that will be fine. The CPU's "pin 1" is located at the bottom of the PCB. Make sure the dot or arrow on the PLCC socket is also pointing towards the bottom of the board as shown below. GAL PIN 1 is also shown in red. You can also verify with the orientation of the text on top of the GAL. There are 5 SIL resistor packs supplied. The direction they are inserted is important. On the resistor arrays (black as shown in the images) they have a small white dot which denotes pin 1. Also the booster PCB also has pin one marked. I have circled a couple of them in yellow to show how they are fitted. Below marked in RED is a wire link which connects to CE on the booster board and links to the ROM board as shown. Marked in yellow is the 8/32MHz switch wire. This can be left unconnected for 32MHz operation. Or it can be linked to a switch to connected to 0V/GND to switch back to 8MHz mode. Above is the other end of the 32MHz which which solders onto U405 pin 4. While in general this wire should be kept short, I would advise to route the wire downwards as shown and then to the booster board. Keeping the wire away from the video area as it can pickup interference. To test things out I suggest GB6 which can be found HERE. It has come to my attention ( here ) that some STE's may have a 74S257chip for U405. This chip does not output correct TTL voltages to drive the booster. As such the machine will likely be unstable or not boot. This IC should be replaced with a 74F257 IC.